Sixteen year old Billy chooses homeless over home. He leaves Longlands Road, the school he hates, his dog, and his hateful and cruel father, and arrives in Bendarat via a freight train carriage. It is in a train yard that he makes his home. There he meets the hobo Old Bill, who has abandoned a significant life to hopelessness and the bottle. Rich girl Caitlin works at McDonald’s for reasons of her own. These three characters carry baggage. Their lives become permanently plaited together by the irreversible hand of fate. The story is alternately told in the point of view of each character. The reissue of this superbly crafted novel written thirteen years ago, heralds a new generation of readers. Steven Herrick is known as ‘the master of free verse’ and justifiably so. His work is pure and precise, pared down to the bare essentials of language. 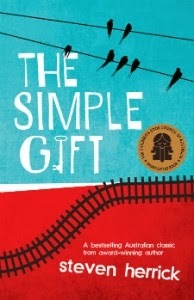 Perfect in every way, The Simple Gift is a novel of the utmost beauty that draws from the reader a sigh of complete satisfaction. Its themes of desperation, love and kindness, reflect on humanity’s need to find a place in the world to belong. BIO: Anastasia Gonis is a Freelance Writer, Reviewer and Interviewer who currently writes, reviews and interviews for Buzz Words, Kids Book Review, and other publications. She has published two educational books and is currently working on a YA novel, and a non-fiction book. Find more children's book reviews at The Book Chook by clicking Reviews in the right sidebar.